We can't think of many more zen-tastic environments to practice yoga in than in Ubud's serene and luscious countryside, located in the centre of the Indonesian island of Bali. 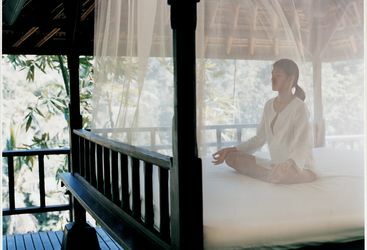 In particular, we are speaking of the world-renowned wellbeing experts at COMO Shambhala Estate. Daily classes, private tuition, and retreat weeks are available so you can finally master your downward dog with help from internationally accredited instructors. The estate's surrounding environment isn't too shabby either with picture-perfect jungle, waterfalls and a river flowing throughout the grounds. We reckon this definitely beats your local class at home.